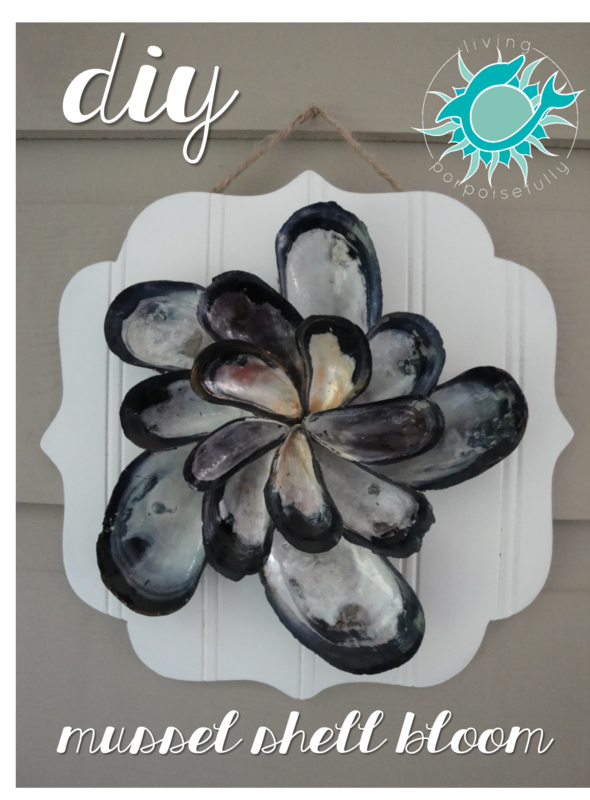 This simple shell bloom craft made of mussel shells we picked up on the coast of Maine brings back such blissful memories! To remember our recent trip to Maine this summer, we did a DIY craft made from the mussel shells we found and collected there. Thanks to a zip-top bag and a huge sand bar at low tide, we came home with mussel shells that were just begging to be re-purposed. So here’s our shell-searching adventure and a DIY craft to go with it! One of our favorite parts of our trip was in Bar Harbor, where a strip of ocean floor becomes high and dry for part of the day when the tide goes out. It offered a unique chance to explore the bottom of the ocean without needing to get more than your feet wet! We saw barnacles, crabs, zillions of periwinkle snails, and other small life forms within the rocks. We also saw tons of empty mussel shells, which prompted the collection of as many of them as my gallon-sized bag could hold, for some type of craft that would yet be decided. We chose only ones that didn’t have a bunch of growth on them – not only would it prevent a certain smell later, but we also didn’t want to take living creatures from their homes. 1. Rinse your mussel shells using a mixture of vinegar and water (I used 1/4 cup vinegar to 1/2 cup water, I don’t think the proportion matters too much). For ones that had a little more crust, I used my thumb to polish it. 3. Once the shells are dry, arrange the first layer of mussel shells on the wood board in a flower or star shape with your five largest shells. 4. Hot glue the first layer of shells down onto the board. Put hot glue on the ridge that will be in contact with the board, and press firmly for a minute while the glue hardens. Continue for all five large shells. 5. Glue the next layer on top so that the medium shells fit between the large shells. Put hot glue down on the part of the already glued down shells that will be in contact with the medium shell (see picture), and then put the medium shell on top of that. Continue for all of the medium shells, then again for the small shell layer. 6. Find a hanging spot, and enjoy! Every time we look at it, it is such a wonderful reminder of our trip and memories! The left over mussel shells will look pretty in a glass vase until I decide to get crafty again. If you’re headed to Maine or a beach location, be sure to take a shell collecting bag with you. You never know what you might find (just be sure it’s not alive) that you can re-purpose to keep the memories near! TIP: If you’re wanting to make a mussel shell craft without having to collect the shells yourself, I did see that there are some wonderful seashell collectors in New England that sell mussel shells in bulk on Etsy. Just search “mussel shells bulk” and you’ll find all sorts of options (and a bunch of really neat ideas for mussel shell crafts too!). I may just have to do this to have enough to make a mussel shell wreath – they are gorgeous!